Yesterday (Sunday) was so relaxing and leisurely. 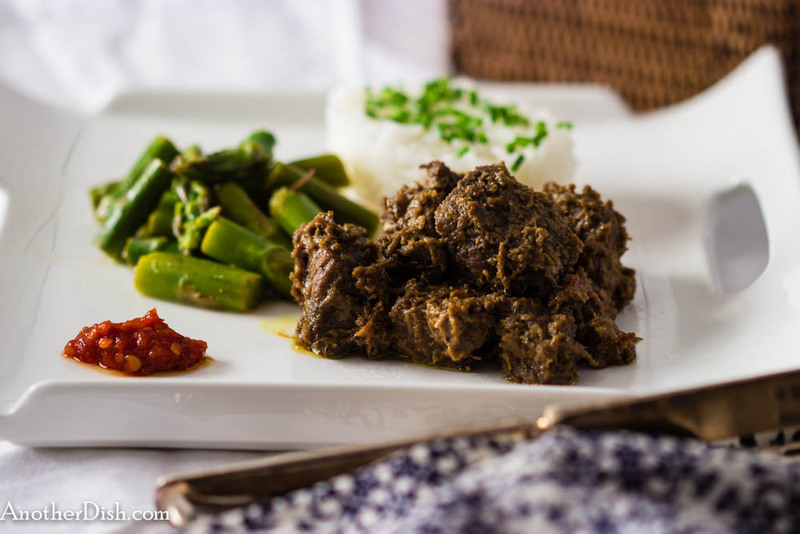 I was in the mood to make something a bit more involved and delicious, so I decided to make one of my favorite Indonesian dishes, Beef Rendang, or Rendang Daging Sapi. I know, the ingredients list is a mile long, and the process takes all afternoon (did I mention “leisurely”). But this dish is worth the effort, and your family will be drawn in by the fragrant, intoxicating and spicy Indonesian smells coming from the kitchen! Definitely a Sunday recipe. I hope you’ll try this dish when you have the time! Make a past be first processing the nutmeg and cloves into a powder in a food processor. Add the shallots, garlic, chilies, turmeric, Laos powder, ginger and candlenuts. process until you have a smooth paste. In a large bowl, combine the beef and spice paste. In a large Dutch oven, combine the beef mixture, coconut milk, brown sugar and salt. Bring to a boil over medium-high heat, stirring constantly. Reduce heat to low, add the lemongrass knots, cinnamon stick and kaffir lime leaves. Stir gently until ingredients are combined. Simmer gently, uncovered, until just about all the liquid is evaporated, the oil from the meat and coconut milk is visible and the meat is very dark and tender. This process can take up to 3 hours, so you’ll need to be sure to stir about every half hour (mine goes the full 3 hours). Remove from heat, stir in the kecap manis and season with additional salt if desired. Serve with steamed jasmine rice and your favorite Indonesian sambals. This entry was posted in Beef, Indonesian, Main Dishes and tagged Chilies, Cooking, Food, Food Photography, Foodie, Indonesian, Indonesian Food, Kecap Manis, Southeast Asian Food, Spicy on March 21, 2016 by AnotherDish. I’ve been cooking red meat like crazy on my new pellet grill/smoker, so it was time to give that a break. This weekend, I was in the mood for something fresh and spicy, so I made this Thai-inspired chicken curry. 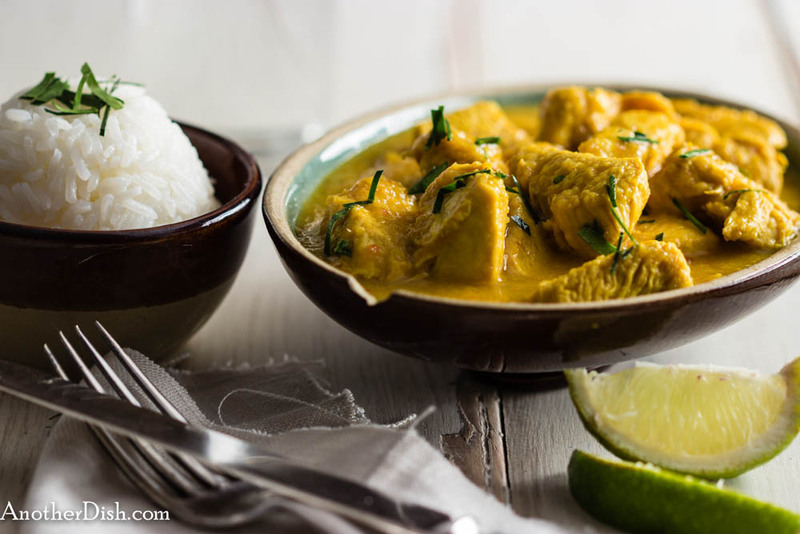 Fantastic – this dish really fulfilled my culinary desires for something different (not that I haven’t posted my share of Southeast Asian curries, but it’s been a while). This recipe can also be made with fresh, peeled and grated galangal in place of ginger — if you have access to that, I recommend it. Oh, and for some added fun for the kids, don’t seed the chilies! I hope you’ll try this dish tonight! Combine first 6 ingredients (onion through turmeric) in a food processor. Process into a fine paste. Heat oil in a wok or Dutch oven over high heat. Add spice paste and stir-fry for 5 minutes. Add chicken and cook an additional 4 minutes. Add the coconut milk, lime juice, lime leaves, sugar and fish sauce. Bring to a boil. Reduce heat to low and simmer for about 25 minutes, or until chicken is tender and sauce has thickened slightly. Remove from heat. Season with additional fish sauce and sugar, if desired. 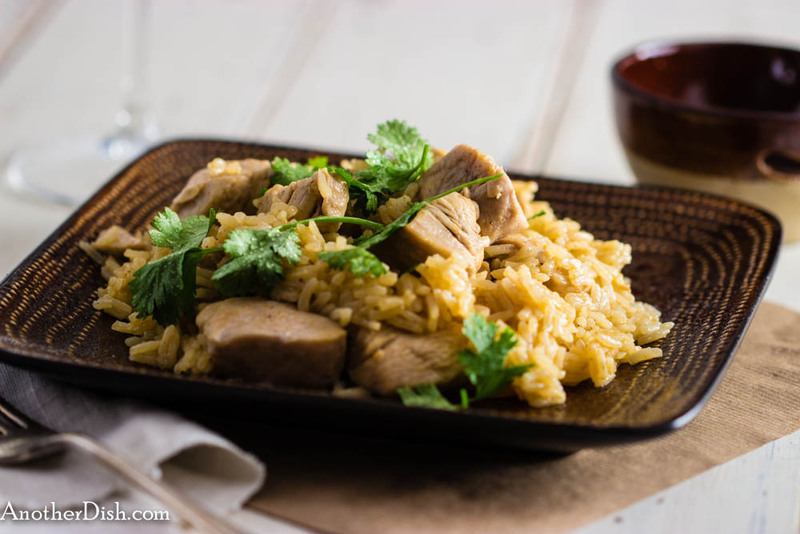 Serve with lime wedges and steamed jasmine rice. This entry was posted in Chicken, Main Dishes, Thai and tagged Food Photography, Foodie, Jasmine Rice, Recipes, Southeast Asian, Spicy, Thai, Thai Food on July 20, 2015 by AnotherDish. A couple of weeks ago, we received our new Rec Tec wood pellet grill/smoker (rectecgrills.com) . I was thrilled to try it out, and I’ve been using it everyday since we got it. I’m very pleased. Over the weekend, I smoked a couple of chickens, which were fantastic. On Sunday, I made this southern-style beef brisket, which was absolutely delicious — the dry rub mixture, beer “beer” mop, and of course, the low-slow smoking technique with the new grill were what made it! I hope you’ll try this stuff out this summer! The night before you want to smoke the brisket, combine the dry rub ingredients (paprika through cayenne pepper in a medium bowl. Rub evenly and generously all over brisket (reserving 2 tsp for the “mop,” which is the basting liquid. Cover and refrigerate until next day. 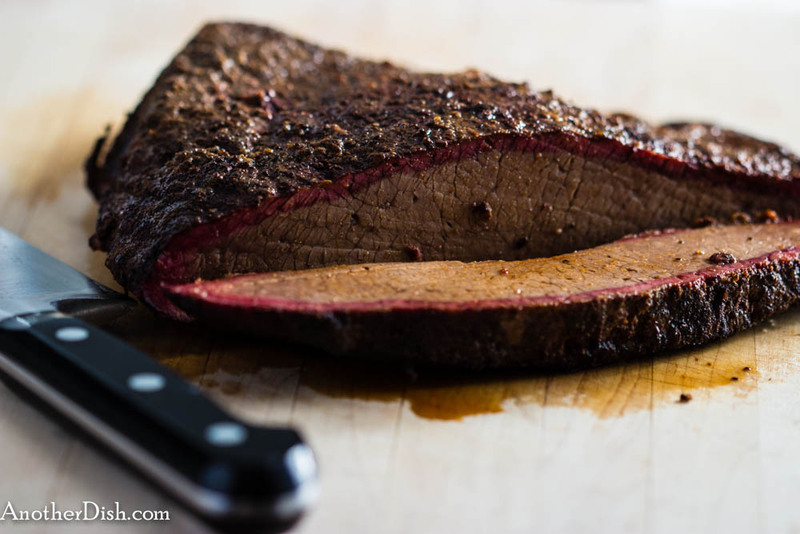 Remove brisket from refrigerator and let stand 45 minutes prior to cooking. Meanwhile, prepare the mop by combining the mop ingredients (beer through dry rub). Simmer for about 8 minutes, then remove from heat. Prepare smoker and bring heat to 220 degrees F.
Place brisket on grill, and cook about 5 hours, until brisket is very tender. Baste with beer mop every half hour. Remove from heat, wrap in foil and let stand 20 minutes prior to serving. Serve with your favorite barbeque sauce, cole slaw and corn bread. This entry was posted in Beef, Main Dishes and tagged Comfort Food, Cooking, Food, Food Photography, Foodie, Spicy, Wood Pellet Grill on June 17, 2015 by AnotherDish. I consumed what seems like a ton of meat at a cook-out on Saturday, so I wanted to grill something meatless. 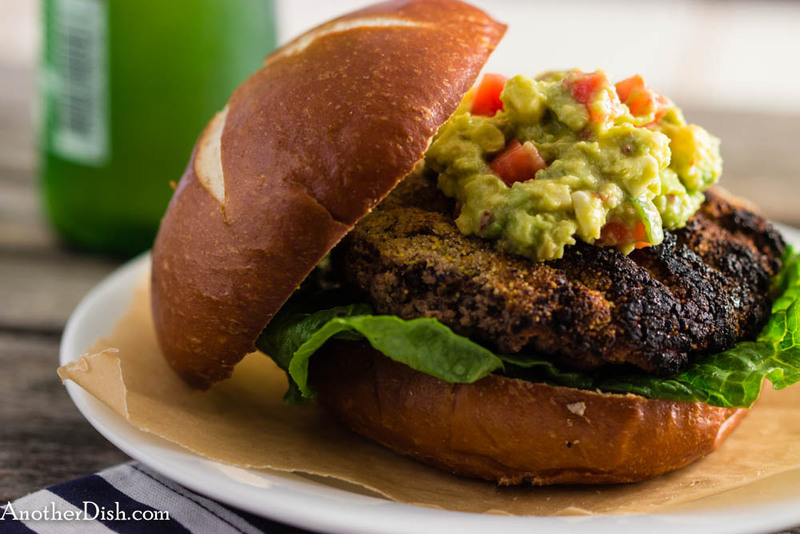 I generally don’t think veggie burgers grill well because they are so delicate (loose, runny, etc. ), so I did my best to use binders (flour, cornmeal and eggs) and a technique (freezing) to come up with something that would work well on the grill — I was successful! These burgers held up and grilled easily to perfection, and the creamy chipotle guacamole on top was absolutely delicious. I hope you’ll try them next time you grill out! Combine first 9 ingredients (black beans through ground ancho chili) and 3 tsp salt in a food processor. Process until ingredients are well-incorporated, but not puréed. Spoon 6 equal portions onto a platter that has been sprinkled with some cornmeal. Form into patties, cover with plastic wrap and place in freezer until firm (about 1/2 hour). Meanwhile, prepare the guacamole by placing the avocados and lime juice in a bowl. Mash with a fork until smooth. Stir in the balance of ingredients (corn through sour cream). Cover and place in refrigerator. Prepare grill. Remove burgers from freezer and place on the hot grill. Grill 5 minutes per side. Serve with lettuce on hamburger buns that have been brushed with butter and browned on the grill. Top each with a generous portion of the guacamole. This entry was posted in Beans, Main Dishes, Sandwiches, Vegetarian and tagged Chilies, Comfort Food, Cooking, Corn, Food, Food Photography, Foodie, Recipes, Spicy on June 8, 2015 by AnotherDish. I’m about to get a brand-new pellet grill — can’t wait to show you how it does! In the mean time, I fired up the Weber grill and made these fantastic satays. This variety comes from the island of Bali (I believe it’s the cinnamon and nutmeg that make them Balinese). I love the combination of spices in these – wonderful with the peanut dipping sauce! This dish is a bit involved, but very well worth the effort. I hope you’ll give this one a try this weekend! Soak about 18 bamboo skewers in water. Combine 1 tsp vegetable oil, 1 tsp sambal ulek, 1/2 tsp brown sugar and the next 13 ingredients (shallots through ground pork) in a food processor. Process well until you have a smooth paste. In a large bowl combine paste and ground pork. Use hand to ensure ingredients are well-incorporated. Cover and refrigerate for 1 hour. Meanwhile, prepare peanut sauce by heating 1 Tbsp vegetable oil in a small sauce pan over low heat. Add onion and cook until soft, about 3 minutes. Stir in1 tsp sambal ulek, 2 Tbsp brown sugar and the next 6 ingredients (through lemon juice). Slowly heat, gradually adding the coconut milk, about 5 minutes. Remove from heat, cover and set aside. Mold about 2 Tbsp of the pork mixture onto each skewer (as in the picture above). Place satays on grill and cook, turning occasionally until done, about 7 minutes. 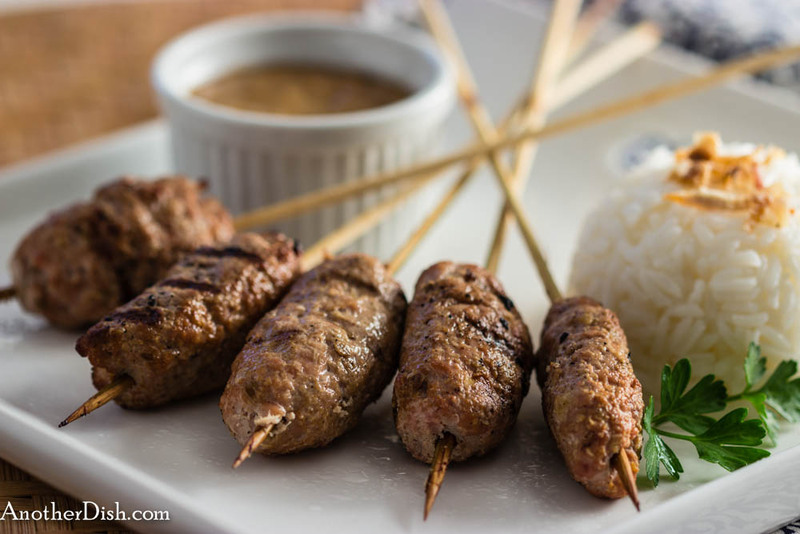 Serve satays with the peanut sauce and steamed jasmine rice. This entry was posted in Indonesian, Main Dishes, Pork and tagged Chilies, Comfort Food, Cooking, Food, Food Photography, Foodie, Indonesian, Indonesian Food, Kecap Manis, Recipes, Southeast Asian Food, Spicy on June 1, 2015 by AnotherDish. It’s been a while since I’ve posted a nice, Southeast Asian dish — the spring weather we’ve been waiting so long for finally arrived over the weekend, so I was in the mood for something spicy (“hot,” “piquant,” etc.). I ended up making one of my favorite Indonesian beef, Dendeng Santan (which translates roughly to dried beef in coconut juice, I think). 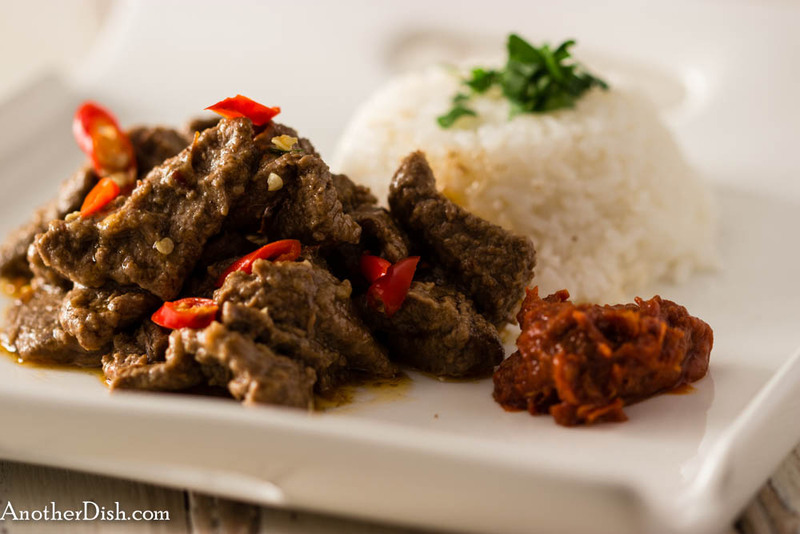 Indonesians typically cook with lean (tough) cuts of beef, such as top round — the beef is cooked for a long time to the point that it is extremely tender and delicious. I didn’t have that much time, so I made this dish with a lightly marbled, boneless beef sirloin steak. The end result was a tender, delicious Indonesian beef dish in a fraction of the time. This dish is delightfully spicy and flavorful — I hope you’ll try it tonight! 1 lb boneless sirloin steak, put in the freezer 30 minutes (to aid in thin slicing), then thinly sliced across the grain into 2-inch long pieces. In a large bowl, combine beef slices, garlic, candlenuts, coriander, tamarind water, brown sugar, galangal powder and salt. Mix well, set aside and let stand 15 minutes. Meanwhile, combine terasi and 1/4 cup of the coconut milk and the sambal olek in a small bowl. Heat oil in a large wok or Dutch oven over high heat. Add beef mixture and cook 2 minutes. Add coconut mixture and bring to a boil. Cover, reduce heat to low and simmer gently for 20 minutes. Remove lid. Add the remaining 1/4 cup coconut milk. Bring to a boil over high heat. reduce heat to low, and cook 15 minutes, or until liquid is considerably reduced. Serve with steamed jasmine rice and a spicy Indonesian relish, such as sambal petai. Garnish with Thai chilies. This entry was posted in Beef, Indonesian, Main Dishes and tagged Chilies, Cooking, Food, Food Photography, Foodie, Indonesian, Recipes, Southeast Asian Food, Spicy on April 20, 2015 by AnotherDish. Hi guys! I probably should have thrown something on the grill out back because it was the fist nice day since last fall, but I ended up making this simple and delicious chicken dish last night instead. This dish features garam masala, which is actually a (yummy) blend of ground spices, and is commonly used in Northern Indian cooking. I’ve never made garam masala my self, since it’s readily available at Indian markets. I’ve found that you need to discard what you have on-hand every 6 months, because freshness, as with most ground spices, is very important to a dish. I enjoyed this dish, and I hope you will to — please consider giving it a try tonight! Heat oil in a large wok or Dutch oven over medium heat. Add garlic and cook 1 minute. Increase heat to medium high. Add chicken and brown on all sides, about 5 minutes. Stir in garam masala and cayenne pepper. Stir in rice and salt, and then the chicken stock. Bring to a boil. Reduce heat to low, cover wok and simmer for 10 minutes. Remove wok from heat and let stand for an additional minutes. Fluff with a fork, garnish with cilantro and serve. This entry was posted in Chicken, Indian, Main Dishes, Pastas and Grains and tagged Cooking, Food, Food Photography, Foodie, Garam Masala, Indian Food, Jasmine Rice, Recipes, Spicy on April 13, 2015 by AnotherDish.